One of the most notable policy instruments that can be used to ensure the adequate provision of public goods by agriculture is agri-environmental measures (OECD, 2010; Hart et al., 2011). These measures comprise a system of voluntary incentives for farmers wherein they sign multi-year contracts with the public administration; under the terms of these contracts, farmers commit to employing a set of specific agricultural practices aimed at improving (or maintaining) the level of provision of environmental public goods, in exchange for an annual payment per unit area that compensates for lost profits, additional costs and transaction costs incurred due to the implementation of these practices (Uthes and Matzdorf, 2013). A typical example of such measures is the agri-environmental schemes (AES) included in the second pillar of the Common Agricultural policy (CAP). Stakeholders participating in the 3rd Local Stakeholders Workshop held in May 2017 agreed AES is the most suitable governance strategy aiming at a smart provision of biodiversity in the agricultural system analysed (Mountain Olive Groves). Main advantages given by stakeholders were that this policy instrument ensures an improved provision of public goods (especially biodiversity) with relative lower transaction costs and non-desired issues (such as moral hazard and adverse selection). For this reason, once the public intervention is justified, it is reasonable to propose the implementation of a new AES that encourages the use of agricultural practices that improve the provision of biodiversity (Villanueva et al., 2017b; Villanueva et al., 2015). Numerous studies have demonstrated the high potential of olive grove systems to improve their biodiversity supply (see, for example, Rocamora-Montiel et al., 2014; Villanueva et al., 2014). These studies have identified soil management practices and phytosanitary treatments amongst the most important elements for olive growers to improve, from an agri-environmental perspective. As such, an AES aimed at improving the biodiversity of the mountain olive groves should be designed to promote the use of cover crops and the correct choice and dosage of biocidal products. Along those lines, a possible AES might consist of five-year contracts through which olive growers would commit to employing, in exchange for an annual per-hectare payment, a set of practices to improve the provision of biodiversity. These agri-environmental commitments could be set out in the corresponding contracts establishing certain levels of stringency for the three following variables: cover crop area (CCA), cover crop management (CCM) and insecticide treatment (INT). The levels of these three variables are set in an attempt to include a variety of practices associated with different levels of provision of the biodiversity public good, from the minimum level required by cross-compliance, to the most demanding level. In practical terms, five alternative designs or scenarios for AES application have been proposed, with increasingly stringent requirements. Further details can be consulted in Villanueva et al. 2017a). Experts find agri-environmental schemes (AES) as the most suitable governance mechanism to promote an improved provision of public goods by mountain olive groves. Results from a mathematical programming analysis show that a new AES focusing on the 60% of mountain olive growers more prone to participate, with higher monitoring rate and tougher sanctions compared with AES currently implemented, would increase social welfare. 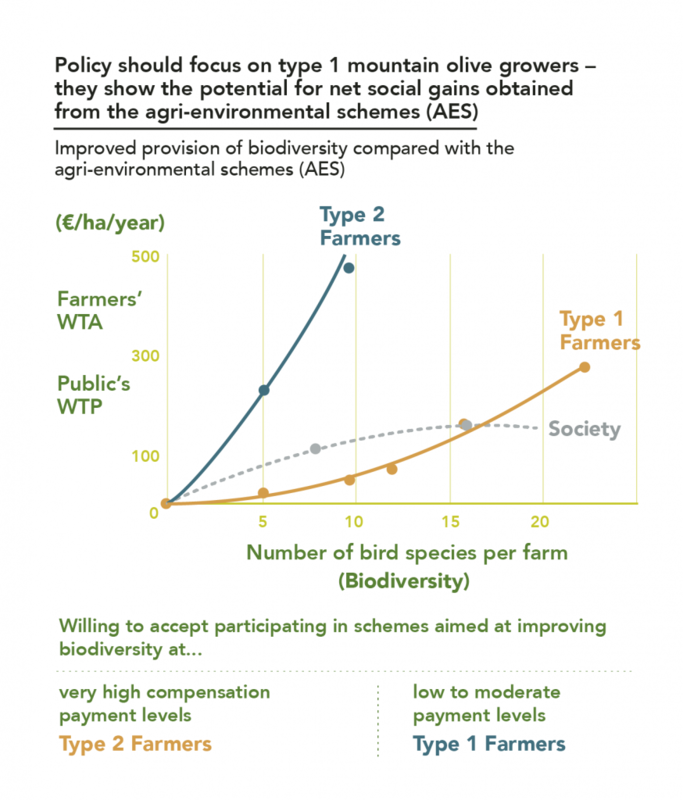 As shown in the graphic, the high WTA in Type 2 (40% of mountain olive growers) means that this group’s costs to increase biodiversity provision exceed the associated social benefit for any level of improvement in this public good. Hence, when social welfare is maximised this class does not satisfy the participation constraint, meaning that the proposed optimisation model excludes it from implementation of the scheme. 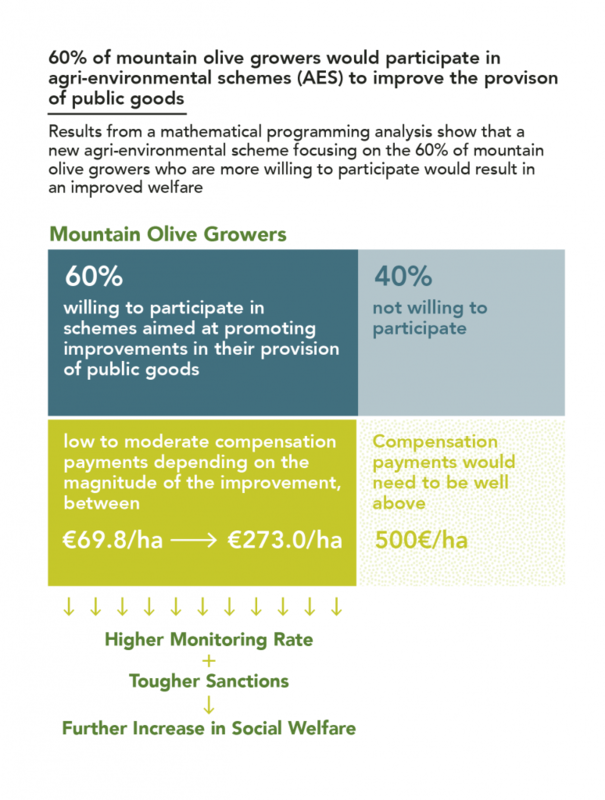 60% of mountain olive growers are willing to participate in AES aimed at promoting significant improvements in their provision of public goods at low to moderate compensation payments (ranging at €69.8/ha to €273.0/ha, depending on the magnitude of the improvement). On the contrary, the remainder 40% would not be willing to engage in this type of schemes (as the compensation payments needed to do so are well above €500/ha for any improvement). Further details can be found in Gómez-Limón et al. 2019. 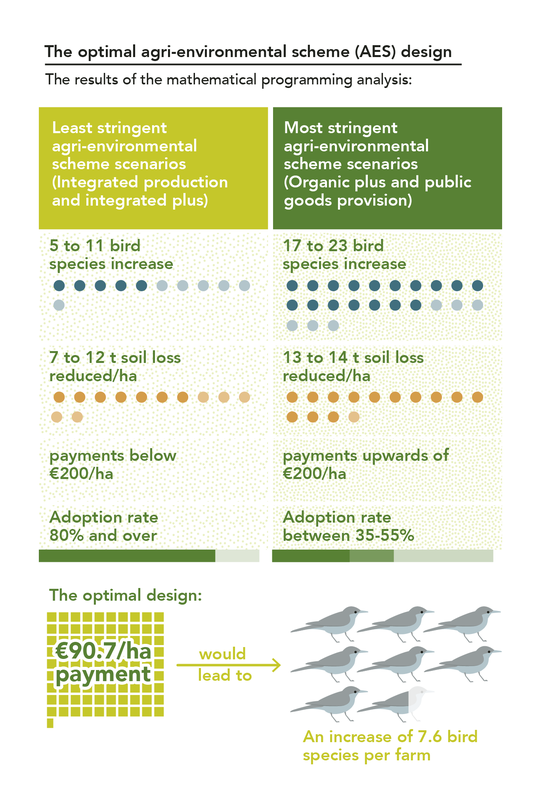 In light of this result, the optimal AES design would be based on a single agri-environmental contract designed for farms with the lowest costs of provision (Type 1 farmers), which would not in any case appeal to Type 2 farmers. Accordingly, AES could be uniformly rolled out through a single contract applicable to all olive groves, which would reduce the transaction costs of the scheme for both the public administration and the farmers, by facilitating the promotion of the scheme, information and support provided, contracting and subsequent evaluation. It is worth remarking that, considering that AES are voluntary contracts, the enrolment of Type 2 farmers in the scheme proposed would only be possible by setting extremely high payments covering compliance costs for any effective improvement in the provision of biodiversity. Thus, taking into account that this cost of provision is much higher than the associated social benefit, the option of promoting Type 2 farmers engagement in this scheme would lead to a decrease in social welfare (inefficient policy implementation). Hart, K., Baldock, D., Weingarten, P., Osterburg, B., Povellato, A., Vanni, F., . . . Boyes, A. (2011). What tools for the European agricultural policy to encourage the provision of public goods? European Parliament, Brussels. http://dx.doi.org/10.2861/86508. Gómez-Limón, J.A., Gutiérrez-Martín, C. y Villanueva, A.J. (2019). “Optimal design of agri-environmental schemes under asymmetric information for improving farmland biodiversity”. Journal of Agricultural Economics, in press. OECD (Organisation for Economic Co-operation and Development). (2010). Guidelines for cost-effective agri-environmental policy measures. OECD Publishing, Paris. http://dx.doi.org/10.1787/9789264086845-en. Rocamora-Montiel, B., Glenk, K. y Colombo, S. (2014). “Territorial management contracts as a tool to enhance the sustainability of sloping and mountainous olive orchards: Evidence from a case study in Southern Spain”. Land Use Policy, 41: 313-325. http://dx.doi.org/10.1016/j.landusepol.2014.06.016. Uthes, S. y Matzdorf, B. (2013). “Studies on agri-environmental measures: A survey of the literature”. Environmental Management, 51(1): 251-266. http://dx.doi.org/10.1007/s00267-012-9959-6. Villanueva, A.J., Gómez-Limón, J.A., Arriaza, M. y Nekhay, O. (2014). “Analysing the provision of agricultural public goods: The case of irrigated olive groves in southern Spain”. Land Use Policy, 38: 300-313. http://dx.doi.org/10.1016/j.landusepol.2013.11.018. Villanueva, A.J., Gómez-Limón, J.A., Arriaza, M. y Rodríguez-Entrena, M. (2015). “The design of agri-environmental schemes: Farmers’ preferences in southern Spain”. Land Use Policy, 46: 142-154. http://dx.doi.org/10.1016/j.landusepol.2015.02.009. Villanueva, A.J., Gómez-Limón, J.A. y Rodríguez-Entrena, M. (2017a). “Valoración de la oferta de bienes públicos por parte de los sistemas agrarios: el caso del olivar de montaña en Andalucía”. Economía Agraria y Recursos Naturales, 17(1): 25-58. http://dx.doi.org/10.7201/earn.2017.01.02. Villanueva, A.J., Rodríguez-Entrena, M., Arriaza, M. y Gómez-Limón, J.A. (2017b). “Heterogeneity of farmers’ preferences towards agri-environmental schemes across different agricultural subsystems”. Journal of Environmental Planning and Management, 60(4): 684-707. http://dx.doi.org/10.1080/09640568.2016.1168289.